At Shefford Osteopathic Clinic, we can treat you no matter what age you are. What we treat, how we treat, and how we assess you will change as you get older. The most common time of life to visit an osteopath is between 30 and 60. This may be because people are feeling stiff and uncomfortable but are still active enough to want to continue their hobbies and activities. Our bodies begin to decline in terms of physical potential around the age of 30. This can be measured by looking at strength, cardiovascular performance and reaction time. After 30, it is a general rule of thumb that we lose 1% of our physical potential per year. However, we all age at different rates with genetics, activity levels, and life events such as illness or trauma having an impact on how well our bodies cope with getting older. For example, a person who continues to do cardiovascular exercise such as cycling as they get older tends to have 50% less decline than those who are sedentary. In our experience, people are more likely to say “it’s because I’m getting older” as they reach their mid to late 40s. This may be because they have begun to experience some joint stiffness, or notice they can’t quite perform to the mental or physical level that they are used to. Later in life, the bones can lose density leading to osteoporosis. These developments lead to changes in posture, ranges of movement and levels of pain experienced on movement. When a person gets over 65 years of age they would technically be classed as a geriatric, however as people live healthier and longer lives a person may not be treated as a geriatric until they are 70-75. 1. Physical activity is key to remaining as healthy as possible as we get older by doing a mix or aerobic activity and strength training. For instance we all are probably aware that aerobic exercise will help you maintain a healthy heart and lungs, but did you know that it also protects against the loss of cognitive functions such as memory, processing speed and decision making as well? We can help by offering exercise tips and advice. A large study in 2008 showed that men who demonstrate higher levels of strength are more likely to live longer, and this effect is increased if they already have a good level of cardiovascular health. 2. Reduce the risk of falls and therefore possible fracture and less risk of the loss of independence. We do this by giving appropriate balance and reaction exercises, alongside treatment to help alleviate a stooped posture (which limits the visual field and increases postural instability); we can also increase mobility in the ankles and knees to increase the person’s ability to arrest a fall. 3. As we get older the soft tissues and joints of our body change to have the effect of limiting our movement, this means we are less able to move as expansively as before making everyday activities such as stair climbing and getting in and out of a car more difficult. We use various, gentle forms of manual therapy, such as joint articulation, massage as well as medical acupuncture. These can help increase the range of motion possible at specific joints, in specific ways to allow easier and less painful movement. 4. By chatting with you, we determine what you want from treatment and then design a bespoke treatment plan for you. By getting to know our patients, including their social structures and their mental state, we are also able to advise of specific support resources that they may find useful. 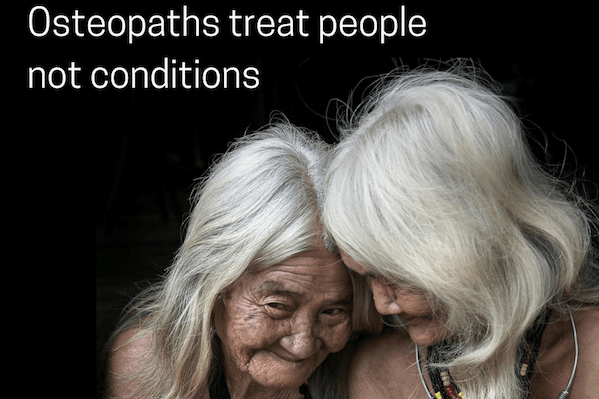 We hope this article shows that osteopathic treatment can benefit people of all ages, the style of treatment may change, but our practitioners have the skills to accurately assess and treat people in their old age. Oh, and if you want to know, our oldest patient is 93 and our youngest was 6 days old! Osteopathy really can be for everyone.